It is the policy of the DHBA Board of Directors from time to time to entertain formal requests for monetary support, sponsorship and/or donations at the Board’s sole discretion. Such request should be submitted electronically to any current DHBA Director in Word or PDF format at least thirty (30) days prior to the date the requested support is needed. The request (not to exceed one typewritten page) should contain the following information: the name of the requesting organization; the nature of the request (i.e. specific amount of money requested); the name, telephone number and email address of a contact person; date needed; and the purpose or explanation of request (e.g., explain why the support of the DHBA is needed, why the funds cannot be obtained elsewhere, what the DHBA’s support will accomplish, how the supported effort’s goals and objectives conform to DHBA’s mission, etc.). 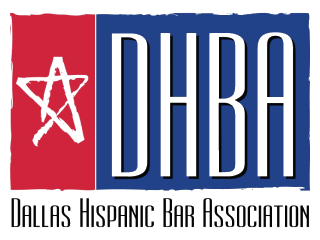 The DHBA’s goals are to provide legal services to the Latino community, to enrich and ensure the success of its members in the legal profession in Dallas and to become actively involved in issues affecting the Latino community; therefore, priority will be given to organizations and causes which support and further these goals. Generally, it is DHBA policy to not consider any request for monetary support for sponsorship of or donation to an individual, though it is in the discretion of the DHBA Board of Directors to entertain those requests as it deems necessary or desirable in furthering DHBA’s mission, to the extent not prohibited under the DHBA bylaws.